How long does it take to make an episode of The Good Place in which D’Arcy Carden channels nearly all of her co-stars for a half-hour? At a press event this week in L.A., Good Place creator Mike Schur said “Janet(s)” has been in the works for over a year. In fact, Carden told journalists that she was still recording ADR for the episode just last week. Schur said he instructed Carden to prepare for the episode—in which the show’s four human protagonists hide in Janet’s void, thus rendering them into Janets themselves—in March, four months before the episode actually filmed. The cast started rehearsing the episode earlier than they would have for one with a more conventional script, and those rehearsals and blocking were filmed, so Carden could watch (“1 million times,” she says) how the actors moved and spoke—and so the movements could later be mapped for special effects. Carden also made an audio recording of the cast during the table read. As to what Good Place viewers can expect when the show returns in 2019, Schur was cagey, though both he and Carden said that Chidi and Eleanor will continue to be in it to win it, romantically. (“It’s pretty gooey,” said Schur.) Tahani and Jason will also quickly address their new knowledge of Janet and Jason’s past marriage; the question of why no one has gotten into The Good Place in over 500 years will also be answered. 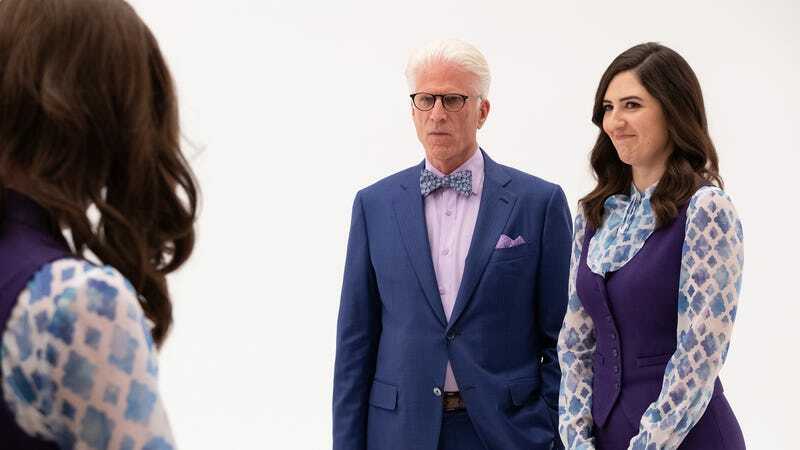 Schur said Michael “now has more information than he ever had,” though he “doesn’t have the full story yet.” Now that he’s in The Good Place, he’ll attempt to execute his plan and right the inequities in the points system. As to whether he’s successful, though, is anyone’s guess.